Was the Voynich Manuscript a modern creation? Over the last year or so I’ve begun to wonder if the bifolios of the Voynich Manuscript may actually be cut from some larger folio stock, which was originally in the form of three or four large, blank quires. If I am correct, I personally think the implications of it, and the opportunities afforded by it, are enormous. 1) Odd Quire Numbers: The quire numbers of the Voynich have some notable problems. Nick Pelling, in his book, The Curse of the Voynich, has an excellent and very complete description of these numbers, and why they are somewhat unusual. He feels that some seem to be original, but some may have been added later, in different hands, and in an odd mix of styles. Nick even feels some were written with a steel nib pen, making them quite modern. But then one might ask, why would the Voynich have needed quire numbers added? That is, it is composed of 18 quires, so why didn’t the original creator originally use quire numbers on all quires? I began to wonder if this was because the source of the calfskin was from a limited number of quires… larger quires, cut down, but with some original quire numbers still being used. And then, there simply were not enough of them to number all of the Voynich’s 18 quires. Also, the quire numbers are in an odd place on the Voynich, in the lower corner of the pages. According to the book Introduction to Manuscript Studies (Clemens & Graham, 2007), quire numbers are normally centered at the bottom of the first or last page of a quire. But in the Voynich, on the side, they are about where they would be if an existing, folio-size quire was cut into quarters, and folded. These resulting, smaller bifolios could be folded next to the original quire numbers, and they would end up near the edge or a fold of a page. 2) The size: A usual folio page, it turns out, can range from between about 12 inches to 16 inches wide, or even more, and be 18 to 24 inches high. The bifolios can be, therefore, 24 to more than 32 inches wide, and taller than two Voynich pages are high. This would mean that one could easily cut four Voynich’s quarto bifolios from one full size bifolio. Since one bifolio is two leaves and four pages, 16 pages could be got from one large bifolio. This then means that a five bifolio large quire could produce 80 Voynich pages, and so only three such quires would be needed to make the whole manuscript, as it originally consisted of 240 pages. 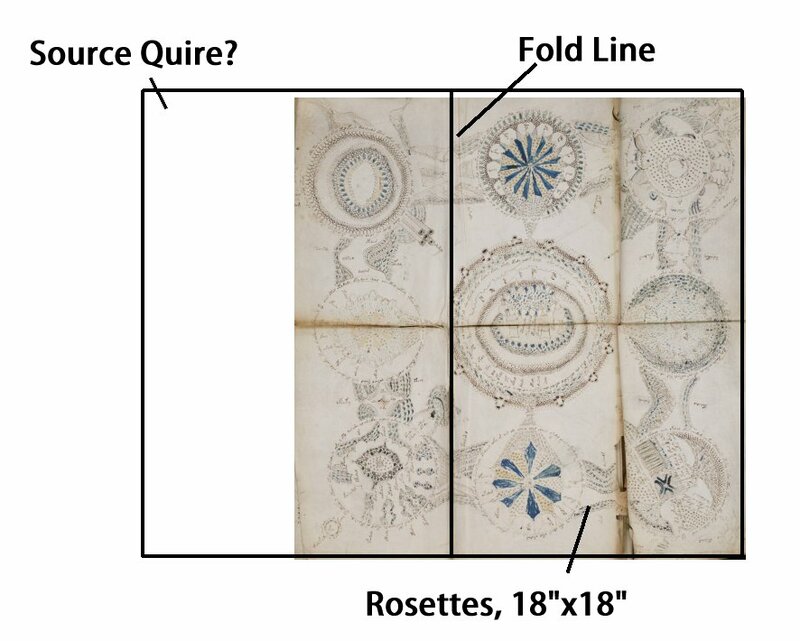 3) Fold outs: The somewhat anachronistic use of fold out pages, and folded “rosettes” map of the Voynich, have been noted by various scholars. It is either rare, or unheard of, to see such fold outs used in the 15th century. And so, for me, it has been one of those “Nagging Signs of Newness”, which I feel point to a modern origin of the Voynich. But beyond that, they make sense with my Three Quire Theory: Large folios would offer enough material, of the correct dimensions, to cut these from. Below see the rosettes fold out, laid against a (very) approximate large folio. Was the Rosettes page cut from an existing, large, Bifolio? 4) White edges: While I was mulling all of this over, Dana Scott related an interesting observation he made when he examined the Voynich Manuscript years ago: That some edges of the pages seemed to be much “whiter” than others, as though they were cut more recently than other edges, and therefore showing the cleaner inside of the animal skin. My thought was that perhaps this meant that the sheets were more recently cut along those edges, from larger stock, as per this theory. Dana did not note which edges looked lighter, but of course I would now be curious to know. And furthermore, if this theory is correct, it might be an aid to “reassembling” all the Voynich’s bifolios into the state they were before being cut. 5) Repairs & Scars: A few days ago I was wondering at this theory again, and went back to read Mr. Pelling’s book again. I wanted to see what other clues it may offer… especially as I remembered that he had “virtually” lined up various scars and repairs, hoping they might be a clue as to the placement of the bifolios on the original skins they were cut from. Of course Nick and I have entirely different conclusions based on his observations, as we do on many issues. To make it clear, Nick does not support my forgery theories in any way. But his observation that certain repairs and scars on some bifolios seem to imply their being from the same source, and show their original relationship, as the repairs line up across them, supports not only his idea that some bifolios are from the same skin, but also, my idea they may be from the same, original, larger folios: Because Nick’s alignment not only allowed for the placement of some bifolios on the same skins, but even placed them both next to, and below and above one another! You can see this on his illustration on page 54, in Chapter 4, “Jumbled Jigsaws”, in which the bifolios f16r/f9r and f10v/f15r have tear repairs that line up, as thought they were originally next to one another. Then, on the ensuing pages, he shows how the f38v/f35r and f36v/f37r bifolios line up in a similar way, this time, on top of one another. Below I show the first example, with the approximate alignment of the repairs marked, as Nick notes. 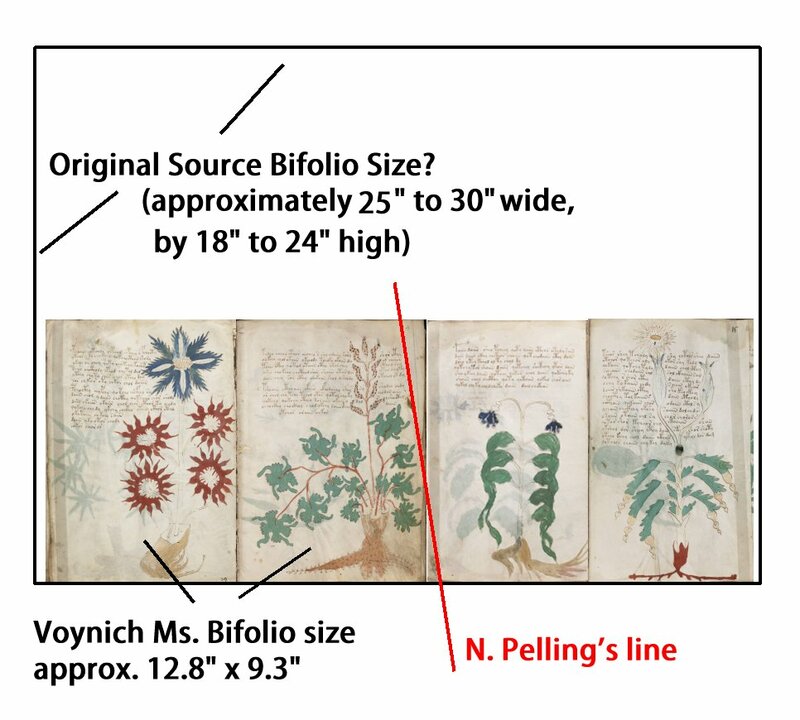 But rather than use Nick’s skin outline, I’ve placed these two Voynich bifolios on my speculative, larger, blank bifolio. Conclusions, testing, and implications: Given the above points, I think it is plausible that the original source of the Voynich material may have been a few blank quires. 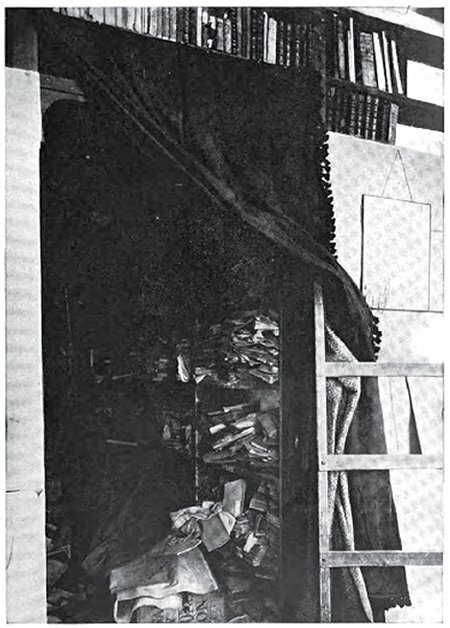 I further think it possible they were found by Wilfrid Voynich when he purchased the Libreria Franceschini in Florence, in 1908. It was a vast repository of over a half a million items, from useless scrap, to valuable treasures, which were accumulated by the previous owner over a four decade span. It is not at all unreasonable to consider, I think, that a few unused quires might have been found among these mountains of materials. And very importantly, if the Voynich was cut from larger, blank stock, originally in the form of blank quires, I think it can be proven to a reasonable extent. This can be done by the alignment of repairs, the position of the whiter (newer) cut edges, the relative thickness of the skin along those edges, the positions of the original quire numbers, and possibly other clues which would occur to one during such an attempt. And then, if this theory is found correct, I feel there is no reasonable alternative explanation to this having been done, other than that old, existing blank stock was used to create the Voynich as a modern forgery. Expert opinions: ‘Not one of mine’ – Voynich Revisionist on The Voynich in 1905? proto57 on The Voynich in 1905?